Depart Cardiff and enjoy a scenic drive through Brecon Beacons National Park. From mountains to moorlands, the Brecon Beacons offer up a stunning mixture of peaks and rolling hills as far as the eye can see. Stop on the border of England and Wales at Hayon- Wye - a bustling market town known as ‘the town of books' - for some free time. Then the black and white half-timbered houses and medieval buildings of Shrewsbury make it the perfect place for lunch under own arrangements. Your final sightseeing on this day is a walking tour of Chester where you will discover a treasure trove of Roman, medieval and Tudor architecture and history. Arrive in Liverpool and check into your hotel for the night. OPTIONAL: Dinner and entertainment at the Spirit of Scotland Show - Spirit of Scotland Show involves a rip-roaring evening of traditional Scottish song and dance accompanied by a great selection of quality Scottish food to delight your pallet. The resident band and traditional Scottish Dancers provide breath- taking performances for their audienceand never fail to entertain. Travel from Edinburgh back to Northern England via the Scottish Borders. En-route stop for photos at the ruins of Hadrian's Wall. Built in AD 122 by Roman Emperor Hadrian, the purpose of this 80 mile long defensive structure was to keep out the ‘Barbarians' to the north. Continue to the historically important city of York. York was a roman garrison town, Viking stronghold and prosperous medieval city and aspects of all this can still be seen today. Your York walking tour will follow medieval city walls and snake through the narrow medieval passageways of the Shambles. After a final breakfast at your hotel, transfer to the airport. Arrive at Dublin Airport. Transfer to your hotel. You are free to explore the city at your leisure this afternoon. Your hotel will be within walking distance of the city centre. Today meet with your coach & English speaking driver/guide & depart Ireland's Capital traveling to County Kerry. En route stop in the town of Blarney to visit Blarney Castle. Here you will find the legendary Stone of Eloquence. Kiss it & you'll never again be lost for words. Enjoy some time for shopping at Blarney Woollen Mills. The presence of the Woollen Mills during the famine shielded Blarney from the worst effects of the famine, due to its employment of local workers. In 1976 Chris Kelleher, himself a mill worker, bought the old mill property. Within a short period of time Chris & his family transformed the mill into what is perhaps the largest quality craft shop in Ireland. Today you can enjoy a superb tour of the Iveragh Peninsula, which will give you the opportunity to discover the Ring of Kerry. 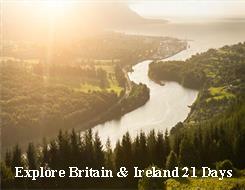 Taking in spectacular scenery such as mountains, peat, bogs, lakes and magnificent views of the Atlantic Ocean. Leaving Killarney pass through Killorglin, famous for its Puck Fair, then to Glenbeigh where the cliff road affords panoramic views of the Dingle Peninsula & Dingle Bay. Passing through the peat bogs one arrives at the sea town of Waterville. Continue to Sneem Village, famous for its brightly coloured houses. The road continues through the mountains to Molls Gap & Ladies View with superb views of the famous Lakes of Killarney. Next today enjoy transportation of a different kind! A pony and trap (also known as a Jaunting Car) helps you discover areas of Killarney National Park that you might not otherwise visit. Relax aboard a jaunting car as your Jarvey [driver] takes you through the magnificent scenery of the National Park. Today enjoy dinner on your own in one of the many restaurants or pubs in Killarney town. Travel northwards to Tarbert & take a short boat ride across the mouth of the river Shannon to land on Clare's shore at Killimer. Travel along the coast to the Cliffs of Moher, the most majestic cliffs in Ireland which rise from the Atlantic Ocean & extend for over 7km. On a clear day, you can admire the Aran Islands & Connemara Mountains. The cliffs reach their highest point just north of O'Brien's Tower, built by the descendants of Brian Boru to entertain his lady friends. A visit to the tower is also possible. Atlantic Edge is the exciting new interpretive centre built into the natural landscape in the cliffs. Enjoy a tour of the Burren Region. The Burren is a strange & unique region in Europe; it is a high plateau of porous limestone situated in Northern Clare. The limestone is bare with no trees growing here or land covering the stone. But the Burren is not as deserted as we believe: the cracks allow different types of flowers to grow all year round. The rocks hide many caves like Ailwee as well as "Turloughs', an interesting phenomenon which transforms lakes into fields during the summer. Continue to Limerick. This morning travel to Galway city. Visit Galway Cathedral, one of the largest & most impressive buildings in the city. The exterior design may not be to everybody's taste, while the interior, with its high curved arches & central dome, has a simple but solid elegance. Enjoy a cruise along the Corrib River to Lough Corrib including scones & an Irish coffee (Including demonstration). This journey on the Corrib Princess takes passengers along the majestic River Corrib and onto the lake. Visitors will see unsurpassed views of the historic monuments & natural amenities that make this one of the most spectacular waterways in Ireland. The cruise sails from Woodquay in the heart of Galway City & lasts approx. 90 minutes. Enjoy the rest of the afternoon at leisure. Today travel through the beautiful Connemara Region, a land of lakes & rivers, bogs & mountains, & small villages where Gaelic is still the spoken language. It is without doubt the wildest & most romantic part of Ireland. Enjoy some time at leisure in Connemara National Park. The park encompasses 2,957 hectares of rugged quartzite & schist terrain of north Connemara from sea level at Letterfrack to some of the peaks of the Twelve Bens Mountains. Visit Kylemore Abbey, built in 1868 by Mitchell Henry, and see its most famous feature the miniature Cathedral. It has been home to the Irish order of Benedictine nuns since 1920. Today travel to Donegal via County Sligo. See the beautiful scenery which was an inspiration for W.B. Yeats, who is buried at Drumcliffe Churchyard, under loaf-shaped Benbulben Mountain. Visit Carrowmore Cemetery which has over 60 stone circles & passage tombs, making it one of the largest Stone Age cemeteries in Europe & is the oldest megalithic cemetery in Ireland. Each tomb is numbered so as to facilitate visitors. The central tomb has been restored to enable visitors to explore the interior of a court tomb & see how it was when it was built over 5,000 years ago. It is a must see for those interested in Archaeology. Continue towards Sligo via Belleek. Here you will visit the Belleek Pottery Factory & see first hand how this world renowned pottery is created. The factory tour allows visitors to see the pottery being removed from its moulds, being fired & decorated by the Belleek artists. This morning depart Donegal for Derry. Upon arrival meet with your English speaking guide & enjoy a walking tour of the Walled City of Derry. Founded in the 6th century by St. Columba, Derry is the 2nd largest city & port of Northern Ireland. In 1613 the city was selected as a major plantation project, organised by the London livery companies. It was in this year that the walls of Derry were built to protect the town from the Gaelic chieftains in Donegal. This afternoon travel along the Antrim coast to Belfast, visiting the Giants Causeway en route. The Causeway was formed more than 60 million years ago when red- hot lava erupted onto the surface of the earth & was cooled by the sea to form the columns which make up the Giants Causeway. Legend tells a different story however that Finn Mac Cumhaill built the causeway over the sea to Scotland in order to fight his arch enemy, Fingal, who had started his own path. The twohad never met before & when Finn heard the heavy footsteps of Fingal he turned back. Helped by his wife, Finn dressed up as a baby & when Fingal arrived & saw Finn, Fingal assumed the baby's father would be much bigger. This scared him & he went running home, destroying the causeway behind him. Continue to Belfast. This morning enjoy a guided tour of Belfast City. This is an excellent way to discover Belfast City & will take in the leaning Albert Memorial Clock Tower (Ireland's answer to the leaning Tower of Pisa) & the Opera House, as well as passing City Hall, the Crown Bar (dating from 1885), Queens University & the Botanic Gardens. Some tours will also visit the Harland & Wolfe Shipyard, where the Titanic was built & launched in 1912. A visit to the Shankill & Falls road will be of interest as it will give the visitor an indication of how life was in Belfast during the troubles. Visit the Titanic Experience Belfast. Located in the heart of Belfast, the Titanic Belfast recreates the story of the world's most famous ship in a new iconic, six floor building right beside the historic site of the original ship's construction. Opened to coincide with the centenary, the self-guided tour begins upon entering the buildings giant atrium where visitors are surrounded by the four "ship's hull' shaped wings which house the Titanic Experience. You will uncover the true story of the Titanic from her conception in Belfast in the early 1900's through her construction & launch, to her famous maiden voyage & subsequent place in history through nine large galleries full of interactive exhibitions. Highlights include views of the slipways where the Titanic was launched & the voyage to the bottom of the sea in the unique Ocean Exploration Centre. Enjoy the afternoon at your leisure in Belfast City. This morning enjoy a tour of the Ards Peninsula. Located in County Down, it separates Strangford Lough from the North Channel on Ireland's northeast coast. Next take the ferry from Portaferry to Strangford. Visit Castletown House, Ireland's largest and earliest Palladian style house, and was built between 1722 and 1729 for William Conolly, speaker of the Irish House of Commons and the wealthiest commoner in Ireland. The facade was almost certainly designed by the Italian architect, Alessandro Galilei, while the Irish architect Sir Edward Lovett Pearce added the wings. Continue on to Dublin. After breakfast with your English speaking guide, enjoy an orientation tour of the city. The North side of the river offers striking monuments such as the GPO (General Post Office) on the city's main thoroughfare O'Connell Street or the Custom House along the quays, as well as Europe's largest public park, the Phoenix Park. The south side appears more sophisticated with its vast Georgian Squares, such as Merrion Square, where Oscar Wilde's House can still be found, its colourful doors along with Grafton Street and its quality shops. This part of the city is also home to the house of Bram Stoker, Trinity College & the Medieval District. Visit Trinity College, Irelands oldest University, founded in 1592 by Elisabeth 1st. Visit the ancient library, containing over 20,000 manuscripts & is home to the 9th century Book of Kells. Last stop today will be a visit to Christchurch Cathedral. King Sitric Silkenbeard, the 1st Christian Viking King of Dublin, built the city's first church on this site in 1038.The current building was built in 1172 by the Anglo-Norman Richard de Clare (Strongbow). Similar to St Patrick's Cathedral, it is adorned with funeral monuments, including the reputed tomb of Strongbow. Unlike St. Patrick's however, Christchurch posses a crypt which stretches nearly its entire length & much of the Cathedrals memorabilia is displayed here. Attached to the Cathedral is Dublinia an excellent exhibition of medieval Dublin. Enjoy the rest of the afternoon at your leisure. After a final Irish breakfast, transfer to Dublin Airport for your departure flight home.